Talking toys usually come preloaded with questions and phrases designed to get children talking, and there’s no telling what kids will feel compelled to discuss. As internet-connected toys have begun to hit the market, concerns have arisen over the safety of talking dolls. In a complaint filed Tuesday with the Federal Trade Commission, several consumer groups say that two interactive dolls -- My Friend Cayla and I-Que Intelligent Robot, both made by Genesis Toys -- collect and use personal information from children. "This complaint concerns toys that spy. By purpose and design, these toys record and collect the private conversations of young children without any limitations on collection, use, or disclosure of this personal information," the Electronic Privacy Information Center, Campaign for a Commercial Free Childhood, Center for Digital Democracy, and Consumers Union said in the complaint. "They pose an imminent and immediate threat to the safety and security of children in the United States." Nuance Communications stores the dolls’ conversations with children and sends them to Genesis Toys to analyze, with the goal of improving performance. But the groups say this move isn’t in line with the federal Children’s Online Privacy Protection Act (COPPA) -- a law that requires children younger than 13 to have their parent’s consent before sharing personal information with an online service. Voice data collected by the toys may not be shared without the consent of the child’s parents, the advocates say. 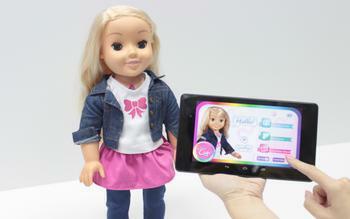 Bluetooth technology enables the dolls to connect to mobile apps, but Genesis may not do enough to ensure that the user’s parents authorized data collection. On Cayla’s companion app, permission is requested to access the hardware, storage, microphone, Wi-Fi connections, and Bluetooth on users’ devices. But the app “fails to disclose to the user the significance of obtaining this permission,” the groups said. Users are simply asked to solve a math problem, which is always the same: 11 plus 16. "Genesis makes no effort to verify or ensure that the person providing consent is the parent," the groups alleged. "Requiring users to periodically answer a simple mathematical equation when opening the Cayla application has no relevance to the identity or age of that user and is not reasonably calculated to ensure consent of the child’s parent." Data collected by the dolls gets translated into text and sent over the internet. Communications between the child and the doll could then be accessed by unauthorized parties, the advocacy groups said. Some of the groups also believe that one doll may be programmed to advertise Disney products to children. The Boston Globe reports that My Friend Cayla will sometimes say that its favorite movie is “The Little Mermaid” and that it loves to visit Disneyland.